Our over railing herb garden 13-inch deck rail Balcony fence planter offers a large planting space ideal for adding decorative accents to your outdoor environment. The Greenbo planter boxes for balconies compression is designed for dimensional lumber and metal railings that are 1” to 4” wide (2x1, and 2x4 railings traditionally) for deck rails, patio railings and even fences. Each deck and rail planter is made with superior quality. Polyethylene plastic that is BPA-free for contact with edibles. Thick-wall resin construction offers excellent all-weather durability for lasting value through the seasons and UV protection helps prevent fading. You'll never have to worry about chemicals leeching into your garden; Just grow big, healthy plants with ease. Greenbo planter boxes over railing is clearly the best choice with its 100% 3 years Guarantee with proof of purchase, it is a RISK FREE purchase you shouldn't pass up. 100% SECURE AND SAFE - The Greenbo patent-inner rib mechanism acts as an anchor, thus making sure that regardless of the railing shape, the Greenbo XL rail planter will be fully stable. (No additional component is needed to make it stable). Also, the pot/window-box weighs over 4 pounds. It's thickness along with its 10" sink length makes it perfectly safe to handle windy environments and high altitude. 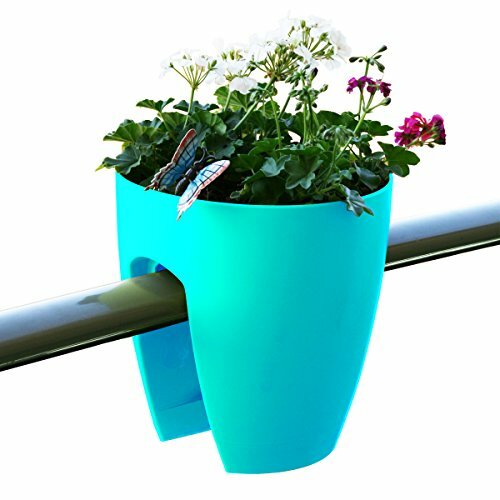 100% WEATHERPROOF - The Greenbo XL Rail Planter is made from durable, weatherproof resin construction. It can resist any kind of weather, as well as the harsh temperatures of summer and winter. Unlike other rail planters, this resin planter won't crack when exposed to extreme weather conditions. SUPERB DRAINAGE - The Greenbo balcony rail planter has two built in draining trays, and therefore the plant's roots are completely separated from any water-remains. EASY MAINTENANCE - With the Greenbo XL Rail Planter, you don't need to worry about stagnant water accumulating. Its no-drip drainage system is made of two removable drainage trays to help drain water and help deliver oxygen to plant roots. If you have any questions about this product by Greenbo, contact us by completing and submitting the form below. If you are looking for a specif part number, please include it with your message.